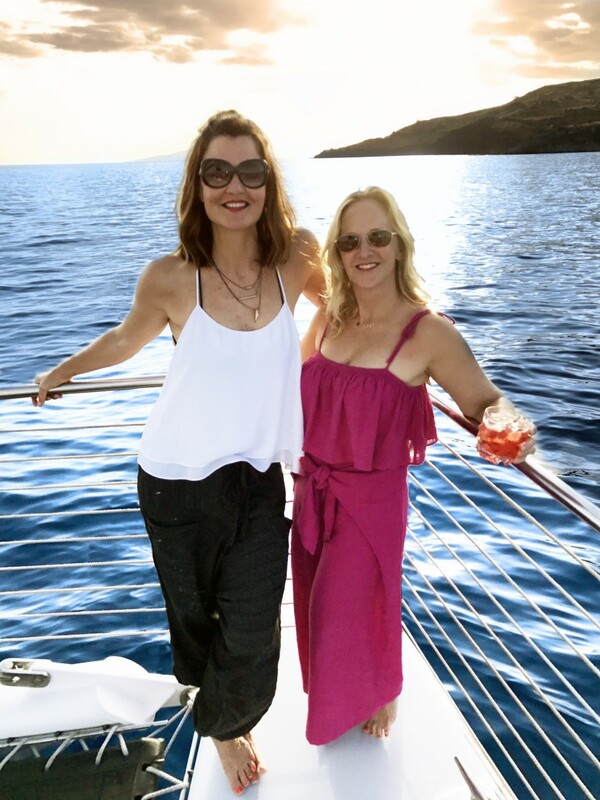 This two 1/2 hour adults-only cruise provided transportation to and from our hotel (the Andaz Maui at Wailea), and I liked that the luxury sailing catamaran was capacity controlled so that guests plenty of space. The $189.00 all-inclusive price included unlimited cocktails as well as dinner and transportation (gratuity is not included). The dinner menu included appetizers such as local vegetable crudités, caprese skewers, cheese and crackers and wide array of selections for dinner. Prime rib, Kiawe smoked baby back ribs, sushi, and crab cakes were very popular. 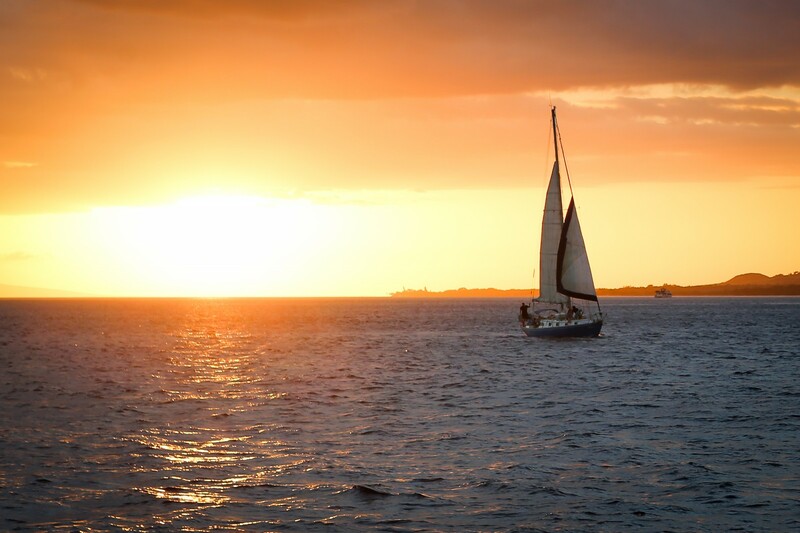 Everything I tried was good but food was not the main focus of this sunset cruise. The full bar with cocktails, beer and wine were also included. There was even a selection of Scotch and after dinner liquors. 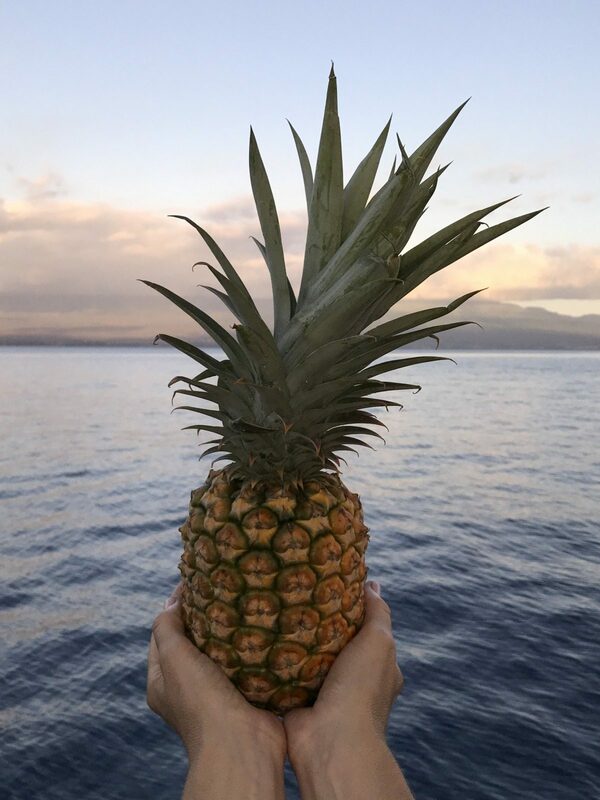 The crew of the Alii Nui made us feel taken care of before we even got to Maalaea Harbor. They were great about confirming pickup time at the hotel via text and our transportation arrived promptly. Guests were looped in on the plan for the evening, and the high staff to guest ratio was nice. 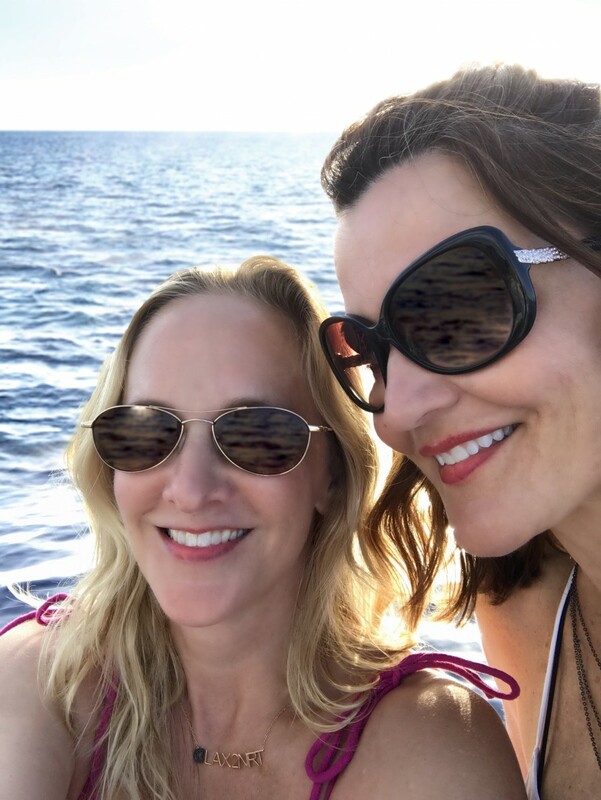 Everyone was ready to have a good time before we took off our shoes once we boarded the 65′ sailing catamaran for this barefoot sunset dinner cruise. 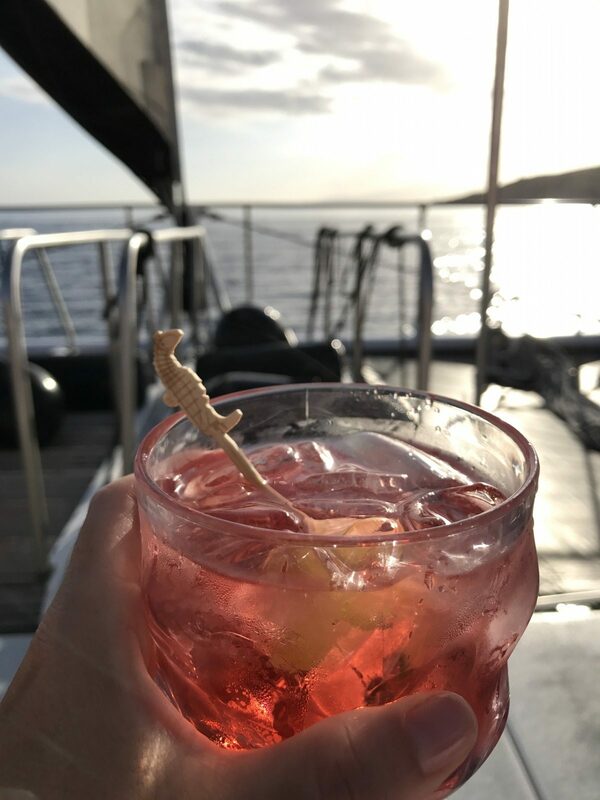 While the cruise was not a tour, the crew was available to answer questions and made sure everyone got enough cocktails and food. They even offered to take pictures of the guests, which was a nice touch. The music selection was nice and played at a non-intrusive volume. I must confess that boats are not my favorite mode of transportation. But sea sickness wasn’t an issue for anyone during this smooth sail. Alcohol brands were premium and cocktails did not seem especially strong, but everyone was having a great time. There were also plenty of non alcoholic beverages as well as coffee and tea. Guests seemed fond of the signature Slip 56 signature cocktail and the Alii Nui Mai Tais. The other guests were friendly and the boat offered enough space above and below deck for guests to spread out. 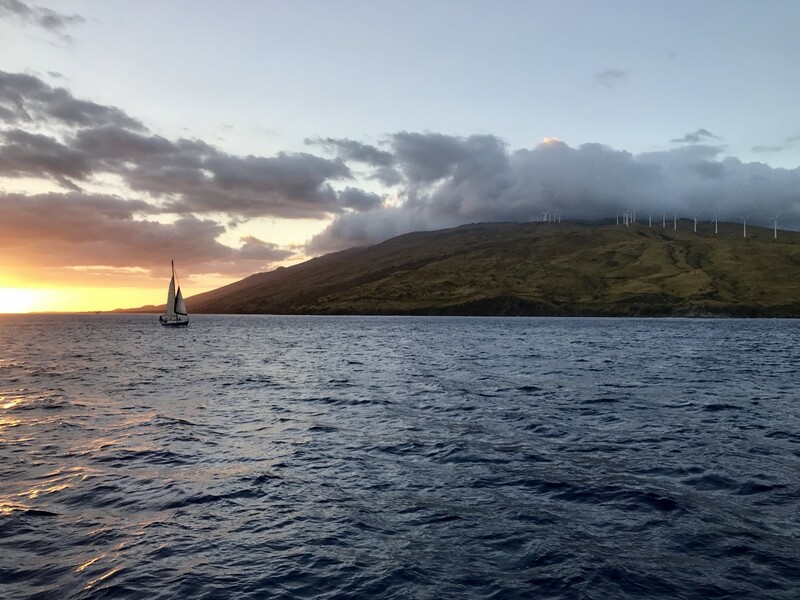 Everyone seemed to enjoy the experience of taking in the blue Pacific waters and the gorgeous sunset and West Maui views. The Alii Nui crew had service down to a science and the separate bathroom facilities for men and women were appreciated. I started to think that Christopher Cross might be onto something with this sailing stuff! 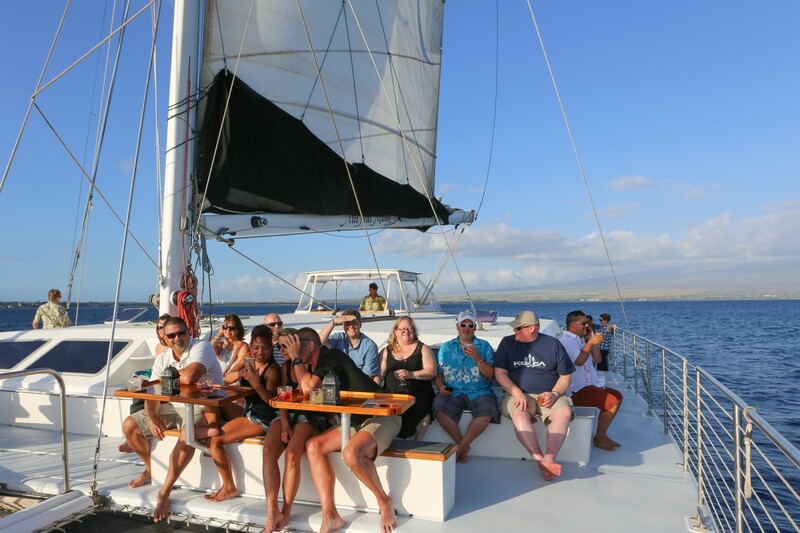 I was impressed with the value for money of the Royal Feast Dinner Cruise on the Ali’i Nui. 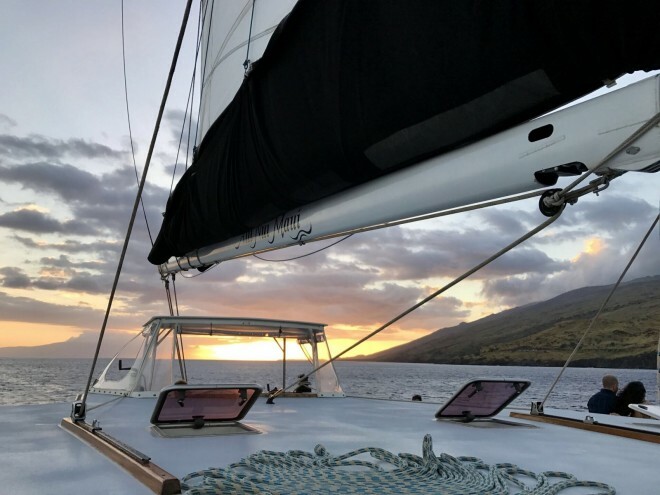 The Alii Nui offers a wide variety of other charters including whale watching, snorkeling trips to Molokini and Turtle Point, and other speciality cruises. 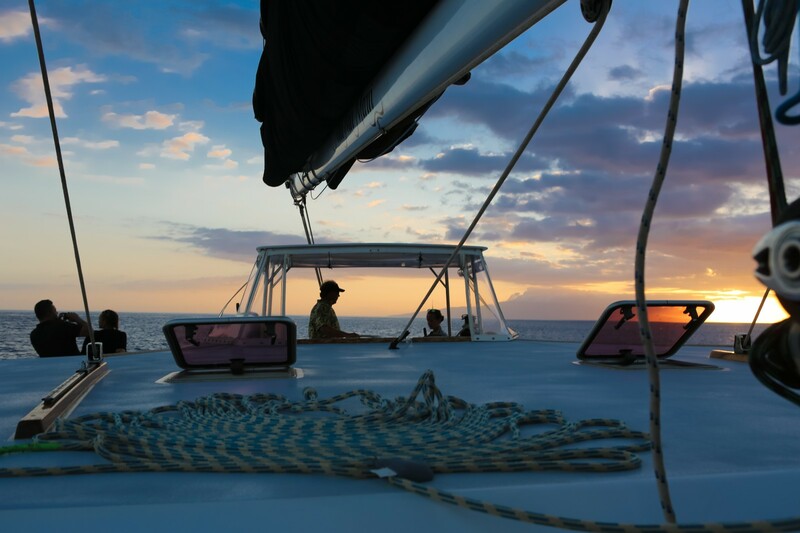 Our experience was so positive we hope to take one of their snorkeling trips on a future trip to Maui.